1) No one I know was injured. No trees fell on our house. We basically got through this storm with nothing more than an inconvenience. 2) We spent some quality time as a family without technology getting in the way. 3) We got to spend a wonderful couple of days with friends. 4) I remembered how much I miss cooking on gas burners, and now I know that I can cook on the propane burner on our grill, which works just as well as a gas cooktop. 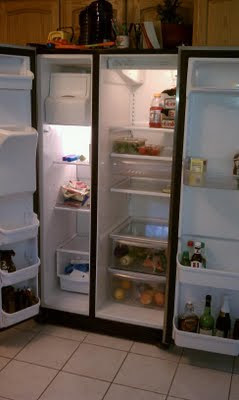 5) My 2 fridges and 2 freezers are now super-clean. 6) I don’t have to feel guilty when my kids watch loads of TV and play Wii for a few days because they were in withdrawal. 7) We have a renewed gratitude for the little things, like being able to flush the toilet and wash our hands after going to the bathroom. 8) We were reminded what amazing friends we have.